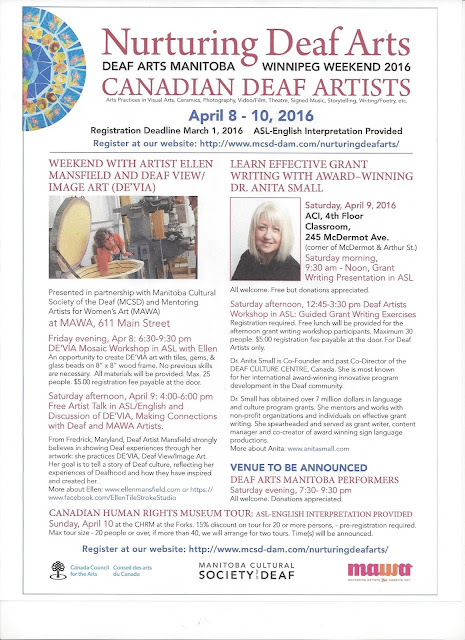 Deaf Centre Manitoba Inc.: Nurturing Deaf Arts is confirmed for April 8-10th, 2016! Nurturing Deaf Arts is confirmed for April 8-10th, 2016! We are very pleased and excited that Nurturing Deaf Arts - Deaf Arts Manitoba Weekend is happening! Mark your calendar for the weekend of April 8-10, 2016! Open to all Canadian Deaf Artists. We encourage you to sign up and spread the word among you friends and peers. New registration deadline is March 1, 2016. There are limited space in the workshops, so apply early to reserve your spot! You can use the forms to register on-line or print out and mail to the address on the forms. Please note: we have a new venue and time for the Deaf Performance. Irish Club, 654 Erin Street at 8:00-10:00 pm. Saturday April 9,2016. Please be aware, at the Irish Club, patrons pay for their drinks (alcoholic and non-alcoholic) at the bar. We will be sending out a Call for Volunteers soon and volunteers will receive a free T-shirt, which reads “DAM…we’re good! MCSD”. We hope to you at the events in April!